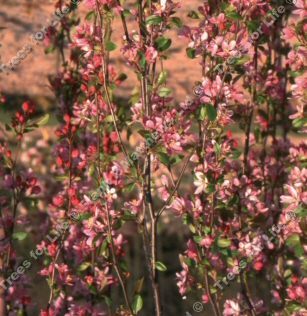 Louisa (Malus 'Louisa') is a graceful flowering crab apple tree, in fact, one of the best weeping crab apple varieties, forming an umbrella shape. It is noted for its dark green, glossy leaves with rose coloured buds opening to true pink flowers. The crab apples are small and an eye-catching lemon-gold colour before ripening to a beautiful golden-orange colour. These fruits festoon the branches in the autumn. A small height tree, so expect a height of up to 4 metres (13 foot) after 10 years. This tree is supplied at a height of between 1.5 and 2.0 metres in a 5-15 litre container for year round planting and better results than from either bare-root or rootballed stock. Any Crab apple tree listed as suitable for patio growing means that it has most likely been grafted onto an M27 rootstock giving it an ultimate height of around 1.5 metres. The standard 12 Litre options are usually grafted onto MM106 rootstock and ultimate heights are determined be each species. Contact us first if rootstocks are important to you. Crab apple trees are generally resistant to disease but those that seem to be considerably less prone to problems are Admiration, Pink Glow, Wedding Bouquet, ButterBall, Cardinal, Comtesa De Paris, Elk River, Coralburst, Donald Wyman, Golden Gem, Gorgeous, Indian Magic, Jelly King, Louisa, Prairie Fire, Rudolf, Sun Rival, Tina, Scarlett, Transitoria, Guardsman and White Star. Crab apples have long flowering periods which makes them very useful as pollination partners. Many commercial orchards inter-plant crab apples with normal apple trees to increase fruit yield. Generally speaking, Crab Apples tolerate drought reasonably well. For best results from the flowers and fruits, a full sun position is preferred however light shade is acceptable. Excessive shade will lead to less flowers and fruits, a more open canopy and problems with Powdery Mildew. Shade and poor drainage is a good combination for bacterial and fungal issues. If your Crab Apple has been grafted (many are) then you may experience small green shoots growing out the side of the tree below the graft point (around 10-30cm above ground) Remove these by rubbing your hand across the bark or snapping off. These will not grow as the original tree you purchased.